The retina offers unique opportunities to define the molecular and cellular pathways mediating neuronal function and disease because of its morphological complexity, well-defined role in visual transduction and the availability of mutants. These investigations are being greatly facilitated by the ongoing identification of genes expressed in the retina using high-throughput methods. The retina of the eye, a specialized region of the central nervous system in which over 50 different neuronal and glial cell types are arrayed in a highly organized laminar structure, has been at the forefront of neuroscience research for over a century . In his 1906 Nobel lecture, Santiago Ramón y Cajal described "the connexions of the visual fibres and the cells of the retina" with beautiful precision and clarity . The neural retina is responsible for photoreception and for the initial stages of visual processing and integration, and the adjoining retinal pigment epithelium (RPE) provides support for its integrity, function and survival  (Figure 1). The exquisite anatomical and functional differentiation of retinal neurons and RPE cells can be explained, at least in part, by their pattern of gene expression, their transcriptome. Although some were surprised by current estimates that the mammalian genome encodes 'only' 30,000-40,000 genes [4,5,6], the complete transcriptome remains incredibly complex because of alternative promoter usage, differential splicing and other post-transcriptional modifications [7,8,9]. A growing body of evidence suggests that the transcriptome of a cell or a tissue is dynamic and stringently regulated and that perturbations often lead to pathological states. Light micrograph of normal human retina stained with Richardson's methylene blue/azure II. 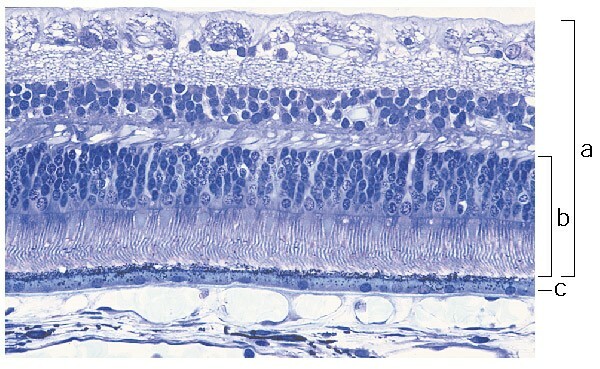 (a) Neural retina; (b) photoreceptor layer; and (c) retinal pigment epithelium (RPE). From the Human Retina Teaching Set, Scheie Eye Institute, University of Pennsylvania, Philadelphia, USA. Courtesy of Ann Milam. Over the last decade, several groups have identified genes and expressed sequence tags (ESTs) from the retina and the RPE [10,11,12,13,14,15], but it is only recently that the retinal transcriptome has been studied with high-throughput molecular and computational tools. In addition, an increasing number of ocular tissues are now being intensively studied. In an effort to promote such studies, and to consolidate information for data-mining efforts, the NEIBank database was created by the National Eye Institute [16,17]. It presently includes sequences from eye structures such as the cornea, ciliary body, fovea, iris, lens, optic nerve, retina, RPE, choroid, trabecular meshwork, and whole eye. Additional useful resources for ESTs that are expressed in the eye (IGene ; J. Yu, R. Farjo, M. Othman, A.J. Mears, W. Baehr, D. Stambolian and A.S., unpublished data), in the retina at 14.5 days of development (RetinalExpress ; Xiuqian Mu, personal communication), and the retina (RetBase ; Nicholas Katsanis, personal communication) will soon be available online. In addition to direct sequencing efforts, several groups have used the serial analysis of gene expression (SAGE) approach  to profile expression in the murine retina , human retina , human cornea , and rat extraocular muscle . Even at this early stage, such analyses have begun to provide valuable new insights into the complex processes of retinal development, aging and disease. Sharon et al. generated 320,998 SAGE tags from the peripheral retina, the macula and the RPE of two human donors. Of these, the 'useful' tags were assigned to 26,355 genes in the retina and 10,404 genes in the RPE. Not surprisingly given the current level of annotation, only three quarters of the retinal tags and two thirds of the RPE tags corresponded to UniGene clusters (each of which represents a putative gene) or to expressed sequences in databases. Similar results were obtained by EST analysis of a smaller set of human retinal  and RPE  cDNAs; a significant proportion of unique sequences found in these studies were either not present in databases or matched only genomic sequences. An analysis of over 500,000 SAGE tags derived from developing and mature mouse retina has also been performed , and other groups have generated a large number of ESTs from retinas at day 14.5 of development  and from developing eyes and adult retinas . Together, these tags probably include most retina-expressed genes; nonetheless, the estimation of a complete set of retinal genes is still difficult because of the short sequence of the SAGE tags and because mouse genomic sequence in the public databases is not yet complete or fully annotated. From the current UniGene clusters, SAGE tags and ESTs [16,17,18,19,20,21,22,23,24,25,26,27,28,29], we estimate that a complete transcriptome of the mammalian neural retina will consist of approximately 25,000 transcripts, and the transcriptome of the RPE will be about 10,000 sequences. Although a majority of the transcribed sequences are also expressed in other tissues, the retina and to a larger extent the RPE have an unusually high number of novel transcripts compared with other tissues. It should be noted that only a limited number of cell-type-specific or preferentially expressed genes (less than a hundred for the neural retina and less than a dozen for the RPE) have so far been identified, yet mutations in many of these have been associated with retinal and macular diseases. Further characterization of novel SAGE tags or ESTs therefore promises to be a fruitful endeavor. As expression profiles of different tissues and cells and of diseased and/or mutant retinas and RPEs become available, it will be possible to identify transcripts that are present in a single or a limited number of cell types and those associated with disease pathogenesis. Comparative gene profiling has already begun to reveal photoreceptor-specific and RPE-specific genes. Blackshaw et al. have identified 264 novel genes that appear to be preferentially expressed in the rod photoreceptors by comparing the SAGE tags derived from control mouse retina with that of mice lacking the cone and rod homeobox (crx) gene, which have abnormal and incompletely developed photoreceptors. From a comparison with SAGE tags from non-ocular tissues, 89 potentially retina-enriched and 53 RPE-specific genes have been identified . A number of SAGE tags and novel ESTs identified from retina and RPE [10,22,23,26,27,28,29] also localize to the region of mapped genetic loci for retinal and macular diseases and can therefore serve as valid candidates for mutation screening. For example, the gene responsible for Best macular dystrophy (VMD2) has been identified not only by a positional cloning approach  but also as a highly expressed EST in a subtracted RPE cDNA library (Y. Li, J. Chang, P.A. Campochiaro, and D.J.Z., unpublished observations). Similarly, transcriptional profiling has also identified a large number of previously identified genes that are expected to have important functions in the retina or the RPE. The significance of studies like these [10,22,23,26,27,28,29] is highlighted by the recent identification of mutations in the IMPDH1 gene in one form (RP10) of autosomal dominant retinitis pigmentosa after both comparative SAGE tag and microarray analyses suggested that it was a candidate [31,32]. Comparative analysis of retinal and RPE expression profiles at various stages of development and aging and during the progression of disease pathogenesis is likely to have broad implications for delineating fundamental biological processes and identifying targets for drug discovery. A major use of a comprehensive gene catalog will be for producing tissue- and/or cell-type-specific gene microarrays [26,27,28,29], which will streamline and facilitate comparative gene profiling and the gene-discovery process. The need for microarrays that include large sets of eye-expressed genes is further illustrated by the valuable information provided by even small gene arrays. For instance, several potential direct targets of the Crx transcription factor were identified using an array of 960 unsequenced retinal cDNAs , and the analysis of a 2,400-gene array revealed almost 20 genes that showed altered expression in older compared with younger human retinas . In addition, the development of complementary technologies, such as the ability to profile gene expression from single neuronal cells , although still technically demanding and often lacking quantitative precision, offers the opportunity to define transcriptomes for individual retinal cells. Not only could different cell types be compared (such as rods and cones), but possible differences in expression between seemingly 'identical' cells, as well as between healthy and nearby diseased cells, could also be assessed. Although the recent progress in retinal and RPE transcriptome analyses has been significant and the promise for further progress is great, a number of hurdles should not be overlooked. For example, the results from EST data mining, SAGE, and microarray analysis do not always agree with each other, nor are they always verifiable with experimental tests such as real-time reverse-transcription PCR. Even using the same techniques, different investigators, often using different reagents, can get varying results. Added to these problems, laboratory molecular biologists often lack the sophisticated bioinformatic and statistical knowledge or collaboration that is essential to addressing these issues, although the situation is improving. As microarray analysis is so dependent on the individual array being used, the use of identical sets of retina (or eye) gene microarrays for multiple investigations will allow better design of strategies for normalization and cluster analysis and more meaningful comparisons between research groups. Assembling a non-redundant set of retina and RPE genes (and genes of other ocular cell types) is therefore imperative and would probably require a large consortium-like approach for the annotation and organization of clones. Additional, and better, computational methods will be critical for generating useful datasets and extracting meaningful information for further biological studies. Nonetheless, the process of unraveling the genes and the molecules responsible for vision has begun. The authors gratefully acknowledge the support from the National Institutes of Health, The Foundation Fighting Blindness, Macula Vision Research Foundation, The Guerrieri Family Foundation, The Steinbach Foundation, and Research to Prevent Blindness Inc.